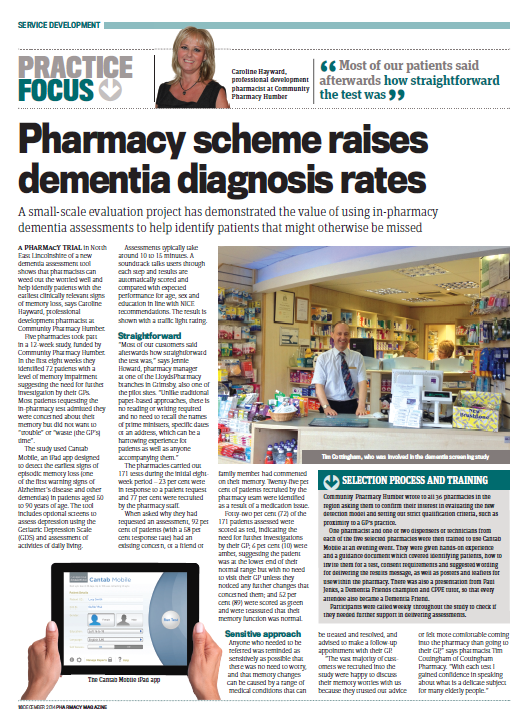 A small-scale evaluation project has demonstrated the value of using in-pharmacy Cantab Mobile assessments to help identify patients that might otherwise be missed. Pharmacies in North East Lincolnshire took part in a 12-week study, funded by Community Pharmacy Humber, using Cantab Mobile the study reasurred the worried well and helped identify patients with the earliest clinically relevant signs of memory loss. In the first eight weeks the study identified 72 patients with a level of memory impairment suggesting the need for further investigation by their GPs. Most patients requesting the in-pharmacy test admitted they were concerned about their memory but did not want to “trouble” or “waste [the GP’s] time”. The study used Cantab Mobile, designed to detect the earliest signs of episodic memory loss (one of the first warning signs of Alzheimer’s disease and other dementias) in patients aged 50 to 90 years of age. The pharmacies carried out 171 tests during the initial eight week period. Tags : No tags found.